How do I reset my PrecisionLender password? Forgot your PrecisionLender password? No problem! 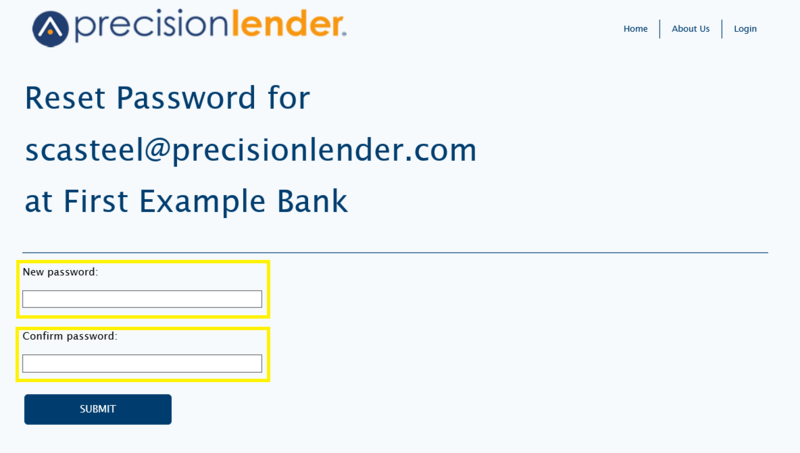 However, please note that the PrecisionLender application has a separate password system from our Support Center. That means that your PrecisionLender application password will not work at the Support Center, and vice versa. How do I use the Support Center? has more information about how to log into the Support Center, as well as resetting your Support Center password. Your bank has the ability to customize what happens when a user gets locked out. If you exceed the number of failed log-ins allowed by your institution, your account may be locked temporarily or until manually unlocked by one of your local administrators. Note: If using the Directory Login from the main website, enter your username and then select next. On the login page, there will be a link called "Can't access your account?" that will let you reset your password. After following the link, fill in your email address/username and submit the request. We will email you a secure link to allow you to reset your password. This email will come from an email address @precisionlender.com so you will want to ensure that you allow email from us into your inbox by allowing email from the precisionlender.com domain through your spam filter by adding it as a trusted domain. When you click on the link in the reset email, you will be required to type in your new password twice. Make sure that you enter your new password one time in each field, and that your browser has not auto-filled one or both of the fields for you. Click "Submit" when you're ready to reset your password.